This is interesting. I like the idea of them cooperating on an investigation rather then this continuing battle of he said/she said. One thought that crossed my mind- Are Turkey and Saudi Arabia choosing to work together to spite those that want them at each others throats? Are they putting the rug back on the floor and firmly standing on it?- Rather then having it pulled out from under them? I'm using that idiom in this manner :To pull the rug out from under someone is to upset their stability or to cause their plans to fail. As stated in an earlier post: Missing "journalist" Jamal Khashoggi? Or Arms Trader Like Namesake Adnan Khashoggi? "- Or if someone kidnapped him while on Turkish territory, though in the Saudi consulate, it might lead one to suspect that acrimony is being further fuelled between the Turks and the Saudis? (Harkening back to the assassination of the Russian Ambassador on Turkish soil. That incident appeared to be an attempt to place a wedge between Turkey and Russia"
A joint Turkish-Saudi team will investigate the disappearance of Saudi journalist Jamal Khashoggi upon the kingdom's request, Presidential Aide Ibrahim Kalın said late Thursday. 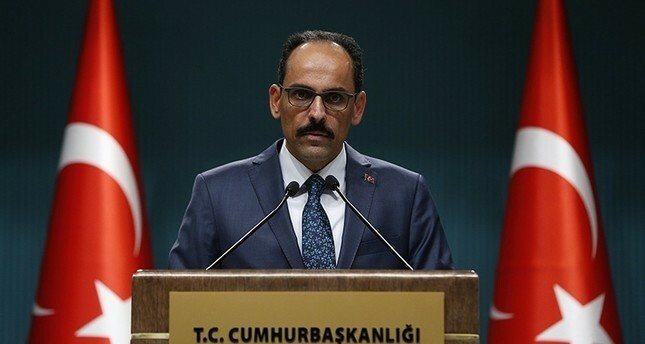 Kalın told Anadolu Agency: "Within the framework of a close cooperation between Turkey and the Kingdom of Saudi Arabia and upon the suggestion of the Kingdom, a joint working team between Turkey and Saudi Arabia will be formed to investigate the case of Jamal in all its aspects." Khashoggi, journalist and columnist for The Washington Post, has been missing since he entered the consulate in Istanbul on Oct. 2. Turkish authorities suspect he was killed. Saudi Arabia denies any involvement in his disappearance. Thinking about the regional remake- ongoing- and recalling that Saudi Arabia is balkanized in the map that was released 2006? I'll check the date and link back to a recent post where that map was shown- For now, busy day, and I got to go! *Did the Idlib Deal Result in Retribution Delivered by Israel and France? To WaPo (https://www.washingtonpost.com/news/global-opinions/wp/2018/10/09/please-president-trump-shed-light-on-my-fiances-disappearance/?noredirect=on&utm_term=.22b3cbd0641c) Mrs. Cengiz tells she got worried after 3 hours and then texted to friends and only asked at the embassy without waiting there: As Khashoggi had his appointment at 1:30 pm she got worried around 4.30 pm. 1) Implausible is that she then, when she got worried, did nothing else but (WaPo) "I texted a few friends to inform them, and I asked about Jamal at the consular building". So she didn't even call or try to call Kashoggi via mobile phone?? Nowadays everybody has a cell phone. And Kashoggi had a fiancee, he had friends and most of all: He was a Journalist, eager to pick up calls of colleagues, from Newspapers he already wrote for or of those which were interested in his work. Worried Mrs. Cengiz not calling Kashoggi on his mobile phone is absolutely implausible to me! 2) BBC News "JAMAL KHASHOGGI: WHAT WE KNOW ABOUT JOURNALIST’S DISAPPEARANCE" from today ( https://www.bbc.com/news/world-europe-45812399 ) tells us: "He reportedly told friends that he had been treated "very warmly" on his first visit and reassured them that he would not face any problems. Despite this, he gave his Turkish fiancée Hatice Cengiz two mobile phones and told her to call an adviser to President Recep Tayyip Erdogan if he did not come back out". In the WaPo article Mrs. Cengiz tells us nothing of these "two mobile phones". Instead she tells us: "Jamal was hardly concerned ahead of his second visit. He walked into the consulate of Saudi Arabia, his native country, without doubting he would be safe there.". So contrary to what Mrs. Cengiz said to WaPo Khashoggi was worried about his second visit to the consulate!. And he even feared he might "not come back out". This is a massive contradiction, that sheds doubt on the whole story! 3) Also the BBC News of today tells us: "She ultimately waited for more than 10 hours outside the consulate and returned on Wednesday morning when Mr Khashoggi had still not reappeared.". As shown in my comment above Mrs. Cengiz could not have shown up at the consulate (probably driving Through the rush hour of Istanbul) before 5 pm. If she then waited "for more than 10 hours outside the consulate" that would be 3 am in the morning. And with this we are fed a fat, fat lie! Because not only that it makes no sense to wait before a closed embassy until 3 pm in the morning. Also this: These embassies and consulates are protected very tightly by the local police-station (opposite to the Turkish consulate in Hamburg there is even a little hut with always a policeman inside - 24 hours a day!). If Mrs. Cengiz really had waited until 3 am before the consulate, probably every 10 minutes a car of the local police-station would have passed her by in very slow speed, the policemen taking a loooong look at her standing/sitting before the consulate. Finally the police would have stopped before her, got out of their car and would have asked her for her identity card. And they would have also asked her, what she was doing in front of the Saudi embassy in the middle of the night! Also, you can bet, the Police would have looked for a bomb and asked Mrs. Cengiz to at least open her bag, so the police could take a look inside. the police would also have registered her identity! But of this we hear nothing from WaPo or BBC. Also we hear nothing of what she told the police officers. This is all a big fat lie! This doesn't mean that nothing happened to Khashoggi. But his fiancee Mrs. Cengiz lies like hell - and that should warn us! Also there must be a reason that Mrs. Cengiz lies! When it is claimed that Khashoggi gave two mobile phones to the alleged fiance- It should not be assumed this was every phone he was carrying. "he gave his Turkish fiancée Hatice Cengiz two mobile phones "
As a statement of fact: we are told he handed over two phones to the fiance- he could have still had phones in his possession he did not hand over. We don't know- we are told he handed over two phones. Also when the fiance states she was told to call someone connected to Erdogan- we cannot verify that statement to be true. She is claiming that because it fits her narrative- we cannot know if he actually said this and considering the many contradictions in the fiance's tale. I've no reason to believe her statement of hearsay. I should have been a lawyer. Or a judge! "As a statement of fact: we are told he handed over two phones to the fiance- he could have still had phones in his possession he did not hand over". Yes, Penny, You are right. But also this handing over two phones to his love is a lie! The first version of the story was: She waited until far behind midnight (3 am!) before the consulate. But this was unbelievable: First because of the unbelievable stupidity to give the attackers against Khashoggi time until 3 am - without doing nothing else! Also because - as I showed - the local police would have got absolutely nervous about this woman before the Saudi consulate and would have searched her for a bomb and would have noted the data of her ID card (and - back in the police station - with their computer would have run through all the police data to find information about her). So the WaPo article changes the story to close this 'gap' and declares that Mrs. Cengiz not at all waited before the consulate until 3 pm, but instead went to the consulate in late afternoon and got the information that Khashoggi had already left the consulate long ago. The liars of the BBC lost this new (and necessary!) switch to the story and still insist of Mrs. Cengiz waiting before the consulate until 3 am. Instead the BBC-liars wanted to 'mend' another 'gap' of the story: That worried Mrs. Cengiz never called her love by the mobile phone ('are You o.k.?') . So BBC invents this Khashoggi handing over two mobile phones to Mrs. Cengiz. Everybody (except You, Penny) would think: 'O.k. now he went into the consulate building without any mobile phone. I mean who has 3(!) mobile phones'. You, Penny, say very rightfully, that Khashoggi could have indeed 3 (1) mobile phones. Yes, that absolutely possible! 1) According to WaPo he gave his love order (if he, Khashoggi, didn't show up again) to call "Yasin Aktay, an adviser to Turkish President Recep Tayyip Erdogan and one of Jamal’s oldest friends". I read this as ONE person - not two. Also the BBC-article says: "Despite this, he gave his Turkish fiancée Hatice Cengiz two mobile phones and told her to call an adviser to President Recep Tayyip Erdogan if he did not come back out". But all mobile phones are different. What button to press to get to the address-list? Also Khashoggi would have been unbelievably stupid to put down name and tel-number of "Yasin Aktay, an adviser to Turkish President Recep Tayyip Erdogan": Mobile phones can be stolen or forgotten someplace. Why would have Khashoggi have saved the clear name of "Yasin Aktay" with a tel.-number in his phone? Much too dangerous! Also Khashoggi certainly never chatted with this important "adviser to Turkish President Recep Tayyip Erdogan" every day for several times! So, of course, believable is only this: That Khashoggi just told his Mrs. Cengiz to write down this important number. 2) Also for one number Khashoggi didn't need to hand over two mobile phones! Also worried as Khashoggi was - contrary to Mrs. Cengiz's lies in the WaPo article - he would always have at least one mobile phone with him when fearfully entering the consulate! Record Snowfall Wallops Calgary! AGW? Suspected Ricin Packages Sent to Pentagon?